FAIRFAX, VA, Dec 6, 2018 – The Fairfax County Republican Committee (FCRC) applauds the Fairfax County Board of Supervisors’ passage of one pension reform at Tuesday night’s Board meeting but denounces the Board’s refusal to support all of the proposed reforms championed by Republican supervisors Pat Herrity and John Cook. The Board voted unanimously to eliminate the pre-Social Security supplement for new employees, offering them the option of offsetting that removal by advancing future retirement income. However, the Board failed to raise the retirement age from 55, thus leaving unsustainable pension costs in place. This takes money from County services and puts taxpayers at risk for future tax hikes. Supervisors Cook, Smyth, and Herrity voted to raise the age to 60. The Board also voted to maintain the “rule of 85” (age plus years of service) by a vote of 7-3 with Supervisors Cook, Smyth, and Herrity voting against this policy. The Board voted 5-5 (tie votes fail) to increase the salary averaging period to 5 years from 3, with Supervisors Smyth, Cook, Herrity, Gross, and Chairman Bulova voting in favor of the change. Finally, the Board voted to eliminate the additional retirement allowance, which increases the retirement annuity by 3%, by a vote of 6-4. Supervisors Smyth, Foust, Herrity, Cook, Gross and Chairman Bulova voted in favor of the modification. The changes approved will go into effect for employees hired after July 1, 2019 and will not impact current employees. 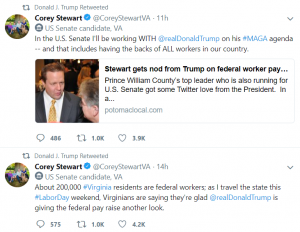 Woodbridge, VA – President Donald Trump has retweeted Republican U.S. Senate nominee Corey Stewart three times in two days. On Saturday, President Trump retweeted Stewart’s call for a federal worker pay increase. Woodbridge, VA – Republican U.S. Senate candidate Corey Stewart today called for the use of capital murder charges for illegal aliens who slaughter innocents on American soil. 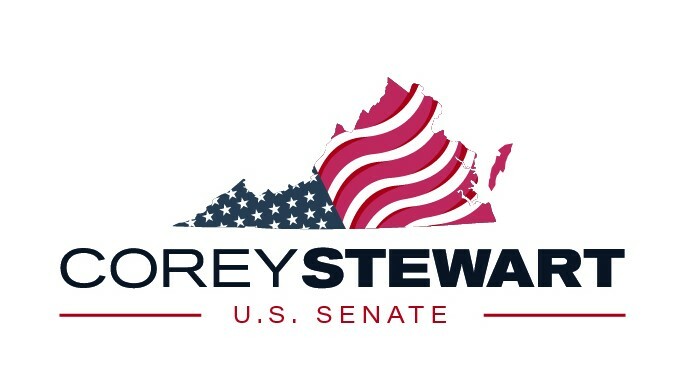 To schedule an interview, contact press@coreystewart.com. Corey Stewart is a Republican candidate for U.S. Senate, former state chairman for Donald Trump, and at-large board of county supervisors chairman of Prince William. 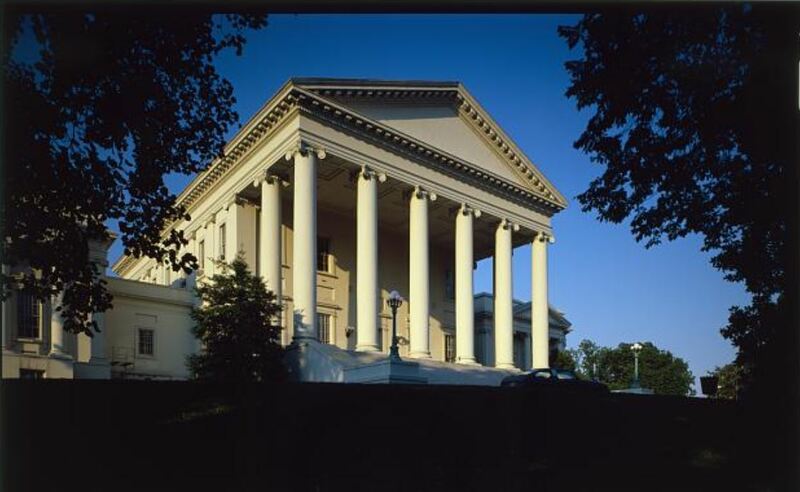 Virginia House of Delegates Speaker Kirk Cox issued the following statement Monday in response to Governor Ralph Northam’s call for a Special Session of the General Assembly to consider redistricting. 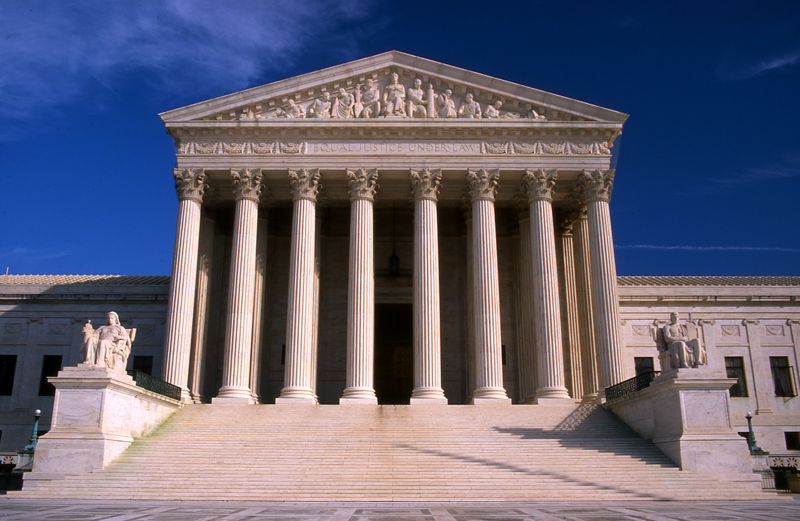 “The House of Delegates will convene as constitutionally-required at Noon on August 30th, though we fully intend to continue to pursue both our request for a stay from the Eastern District Court and our appeal to the United States Supreme Court.